Earlier in 2015 the venerable Al Pacino starred as the titular “Danny Collins”, an aged, one-time great singer/songwriter in the Neil Diamond mold who had drifted, emotionally and professionally, before staging a comeback, of sorts, through the help of a few friends, both new and old. It was schmaltzy Hollywood, plotted like clockwork, and I mean that as a compliment. It was the best Al Pacino has been in years, an authentic Movie Star performance, joyful and big. 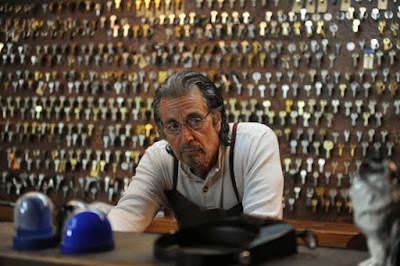 “Manglehorn”, also starring Mr. Pacino in the titular role, is like the indie version of “Danny Collins”; dour and small; Explosions in the Sky in place of Baby Doll. “Manglehorn” was directed by David Gordon Green, the Texan indie film wunderkind who eventually disappointed his loyal followers by going mainstream. Lately, he’s been getting back to his roots, while still dabbling in more vanilla waters, and “Manglehorn” is firmly in the throes of Early Gordon Green, though not always for the better. It is rife with symbolism and meandering speeches, like a monologue about being awed by watching the water from the faucet run which comes across like a recycled American Beauty grocery bag. The narrative, meanwhile, does not move so much as drift, mimicking its protagonist, A.J. Manglehorn (Pacino), a locksmith, a divorcee, a failed father, one who dwells in the past by penning letters to his beloved Clara, the one who requisitely got away. We never learn much about Clara outside of the baroque language in these soliloquies; she really only exists in the abstract. That’s where a lot of “Manglehorn” winds up. A.J. has a businessman son (Chris Messina) and some sort of vaguely defined protégé (Harmony Korine) who runs a massage parlor and is intended, sort of, as the son A.J. wishes he had, or something. These characters seem more like emblems of the past than anything concrete in the present. Even worse, that past is tucked away in a back room at Manglehorn’s rundown house, a room we are strategically kept out of until just the moment we need to see it, a forced narrative trick in a movie that wants us to think it’s purely about atmosphere and acting. Nevertheless, Pacino gives a strange and strangely affecting performance, willingly venturing into wandering old man mode, talking to his cat and attending pancake breakfasts, genuine senior citizen stuff you might have thought such a major-league talent might never do regardless of his age. Pacino purposely plays the part not entirely there; apologetic but unable to muster the precise words for apologies, caring but sometimes struggling to convey that he really does care. He’s at his best, though, opposite Holly Hunter, a bank teller he befriends and then takes out on a few dates. His few scenes with her are tender moments of people who have gone too long without human connection and are trying, awkwardly, to find their way back in. The way he rambles in these moments, absent-mindedly, not even realizing what he’s saying and how he eventually offends her, is both brutal and breathtaking to watch. As out-to-sea as Pacino sometimes plays the part, Hunter plays her character completely tuned in, so much so that you can constantly feel her heart cracking even as she radiates such warmth. It’s the sort of relationship you don’t see as often anymore at American movies, where Hollywood trends younger and younger. These are people that through age and solitude have perhaps forgotten the rhythms of companionship, yet still seek it, for better and for worse. And when “Manglehorn” just settles down and lets it characters exist in the ecospheres they have created for themselves, it doesn’t drift, it soars.